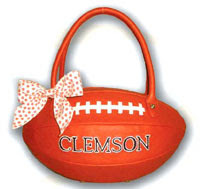 Clemson Girl: Special Homecoming gift from Game Day Divas – 50% off of one handbag of your choice! 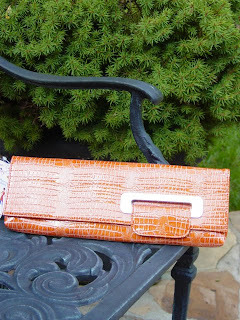 Special Homecoming gift from Game Day Divas – 50% off of one handbag of your choice! 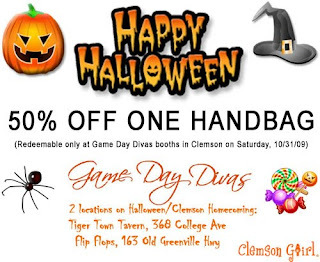 Our lovely ladies at Game Day Divas would like to treat all of the ClemsonGirl.com readers to a special discount for all of the support throughout football season. 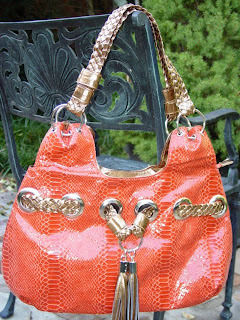 They are giving you the opportunity to purchase a handbag, out of their entire collection, for half price! To take advantage of this special Halloween/Homecoming treat, present this coupon below (click the image for the printable version) at one of the two Game Day Divas homecoming locations this Saturday, Oct. 31st in Clemson. The Game Day Divas will be at two locations this weekend in Clemson – the first is their usual spot, in front of Tiger Town Tavern downtown with the big white tent (click here for a map), and the second, new location (weather permitting) is directly in front of Flip Flops restaurant (used to be Explorers), across the street from Lot 1 near Fike at the end of Williamson Road (click here for a map). The second location is right down from the stadium, so you can easily stop by on your way to and from the game! 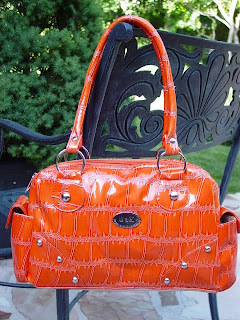 Make sure when you stop by to see the Game Day Divas to purchase your handbag, you also check out their newest gameday jewelry and other fun Clemson items. Please be sure to tell them thank you for such an awesome discount! It’s great to be a Clemson Girl. Go Tigers!! Where can I find a water proof Clemson raincoat/rain suit?